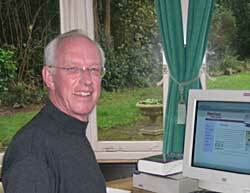 I am Peter Finch, the owner and principal designer and programmer of Peter Finch Web Design. I started designing websites back in 1996, when the Web was new. Before that I was a mechanical engineer. Part of the fun of being a web designer is that the medium constantly changes and develops, and my skills have grown from graphic design and image creation to databases and the programs needed to manage them. I now have the satisfaction of seeing websites I originally created years ago still working hard for their owners, who come back regularly for updates and revisions.